We offer a wide selection of industrial grade interior/exterior floor coating services. We give you the best solutions for your specific project whether it is for your home (residential), commercial / industrial or business needs. Our professional industrial grade liquid granite flooring provides a Beautiful, High Quality, Stain-Resistant, Durable and easy to clean surface. Let us professionally install the floor of your dreams!! Unlike the DIY epoxy garage concrete paint and painting contractor water-based epoxy floor paints that will wear down or peel up, our industrial grade, professionally installed, 100% solids coatings are bonded to the concrete which will turn your garage, patio, carport or any project into the rich, elegant flooring you always dreamed of. Best of all, our industrial grade floor coating systems are UV stable and will not yellow from UV exposure and are thicker than the DIY epoxy coatings so it will remain looking like new for many years to come. Combine that with our extensive application experience and attention to detail, you will see why all our customers are completely satisfied. 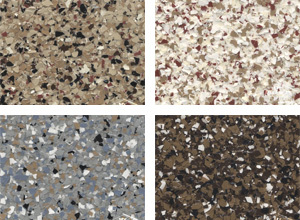 When completed, our decorative floor coatings take on a look as attractive as terrazzo or granite. Choose from an array of contemporary solid colors, stunning Liquid Granite, 3D Reflector Tono or Liquid Metallic, decorative styles including finishes from matte to glossy flooring to customize the floor design that is right for you.